In the early 1980's I had a solar hot water system placed on my roof by Reynolds Aluminum Company. It was Reynolds foray into renewable energy, and since they had been around for decades I felt safe with choosing them. Two years later Reynold sold their solar business. The system itself worked well. It pumped an antifreeze type solution from the basement to the rooftop panels. The solution would be heated by the sun, and travel back down to a heat exchanger atop the new 80 gallon water storage tank. It was a simple system, and worked well for a number of years. I blame the difficulty in obtaining parts, and the rarity of solar technicians as to why I took it off line. Typical rooftop solar panel installation. 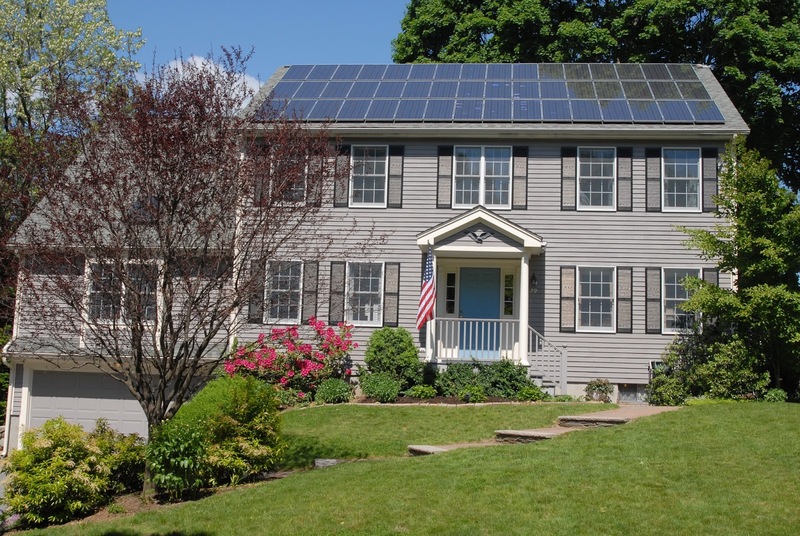 Solar is a great way to augment your electrical usage, or go completely off the National Grid, but today it is more about photovoltaic panels that convert sunlight directly into DC current for your home use. An inverter will change that DC power over to AC. Photovoltaic cells have come along light years since their first use years ago. I like the idea a great deal, and if I could afford a system I would install it to either go completely off the so called grid, or to at least take a bit out of our usage. The overall cost of electricity is not that bad if one just uses their head. The cost of photovoltaic systems far outweighs their benefit for the average home owner. Then came the company Roof Diagnostics. Roof Diagnostics is the solar energy company you hear advertising on the radio a lot. They offer to put a system on your roof, at "no cost" to you, and you will be either no longer in need of National Grid, or a good deal of what they are currently supplying you. Hmm. "No cost" to me, and no longer having to pay National Grid for all, or at least a part of the energy we use. I had to check this out. I had so many questions. Ideally, the best scenario would be to put a solar system on my roof to generate my electricity for my daytime use, and any extra would be sent into the grid through a reverse meter, and we would be credited for it. At night, we could then draw off that credit. That's the best, and ideal situation. The commercials by Roof Diagnostics were interesting, especially since our third party energy supplier is no longer in business as off December we decided to check them out. We always did about 3 to 4 cents per Kwh compared to the National Grid rate with the independent supplier. So, we called for an appointment so that they could share their program with us. Here is the Roof Diagnostics program. They check out the location of your home online, and if it is facing the right way for the best solar exposure, then they figure out how many panels they can put on your roof for the best effect, and the amount of Kwh it will produce. Then they check your credit score. They won't talk to you unless it is 650 or more. I should have known when they shared that piece of information with me that it was going to cost me. Next, they come on over, and tell you how it works. First, you don't have to buy the equipment, or pay for any work done to put in the electrical inverter, and new meter. You do have to lease it for 20 years, however. Lease? Yes, lease. The solar company receives all of the government energy credits, and incentives since they own the equipment, not you. What you get in return is solar electric produced on your roof that will take care of all, or most of your household needs, and any extra will be diverted into the grid as a credit on your behalf. If your average monthly usage is 1000 Kwh, and your system is capable of producing all of your needs, then say goodbye to National Grid, and Hello to the another company with their hand in the mix, the investors. Roof Diagnostics is only the installers. The investors charge you 2 to 3 cents per Kwh less than National Grid does. In our case, based on the location of the panels on the roof would come to $84.00 per month for the 600 Kwh they would produce, and anything over that 600 Kwh would be supplied by National Grid. There would be a charge for that usage. This arrangement is for twenty years. It is a lease. That $84.00 would remain constant for the term of the lease, and is transferable to a new owner if you sell your home. If they don't want it, then what? They only option is to increase the price of your home to cover the cost of dismantling the system. I accomplished the same savings with an independent energy supplier for a number of years until this past December without a lease, or equipment sitting on my roof. I am always looking for ways to lessen our footprint on this rock, and we have done pretty good so far, so I can recommend just using your head. Turn off lights, and equipment when not being used, change over your light bulbs to LED light bulbs, put timers on the lights in laundry areas, outside lights. Unplug phone chargers, have TV systems shut off at night on a timer, and wake up in the morning, and look for a independent electricity supplier for more savings. You can find them online. Simple things that will save you as much as the alternative offered by the a solar lease company. The whole schlemiel about "saving" money, and it not costing you anything, is something you really need to examine. Paying a fixed amount for electricity for 20 years no matter what you do to cut back is not a good idea. The incentive to do better has been eliminated. The inconvenience of having a system sitting on your roof when it comes time to sell your property is another matter. Needless to say, we thanked the young man that stopped by, and shared with us the other night, and told him we didn't think it was for us. Yesterday, I received a followup phone call from the company. I told them the same. The girl at the other end was not happy, and signed off by saying a terse "ok", and then hung up. Sorry, but their plan is ludicrous, and we were not taken in. For us, we'll keep trying to cut back our usage; our monthly bill will remain our incentive, and we'll do fine.